Authorized lyric collection by Edward Ka-Spel, prolific vocal wizard of the Legendary Pink Dots and The Tear Garden. This illustrated book presents song lyrics selected from more than forty albums of Edward’s musical ventures — from 1980 to 2002. In addition, the book comes with a CD-single featuring an exclusive four-part Ka-Spel creation, “090301,” itself illustrated with an original work by New York artist Pieter Schoolwerth. Special features include lyrics linked with their art; lyrics linked with their page numbers, etc. Print run: 2300 copies, the first 834 of which were numbered and wrapped in a silver ribbon (numbered copies are available only through this site). More information about the making of this book — in the form of a conversation. If you wish to use PAYPAL to purchase a single copy of Love and Loud Colours, you can BUY NOW. If you use a second email account when you use Paypal, please send me your primary email contact info as well. NOTE RE: INTERNATIONAL SHIPPING: Some countries have additional customs charges (e.g. : Czech Republic & Russia). If you submit an order choosing the MOST OTHER COUNTRIES option and I later learn your country requires additional fees, I will need to request the additional amount (usually $4). Please email your order request to rapunza[•]loveandloudcolours[•]com. How you heard about Love and Loud Colours. I will reply with your order number, payment total, and payment information. Click on the images below to view sample pages from this book — with audio accompaniment. I interviewed Edward Ka-Spel in 1991 when the Dots were touring their most recent albums, Crushed Velvet Apocalypse and The Maria Dimension. The interview later aired August 16, 1991, on KZSU Stanford 90.1 FM. The buttons below link to a few audio snippets of our conversation. As the recording quality is rather poor (especially for the first one), accompanying text is provided for each portion. The same snippets (noted by asterisks) are included within the transcript of the complete INTERVIEW. Legendary Pink Dot ONLINE CENTRAAL — the official Pink Dot website — provides the latest news, tour information when appropriate, lyrics, images, music downloads, a photo gallery, complete Dots-O-Graphy, and contact information. It is also home to the Cloud-Zero mailing list. All at: LegendaryPinkDots.org. To order musical releases by the Legendary Pink Dots and others, visit their Terminal Kaleidescope and support them directly. 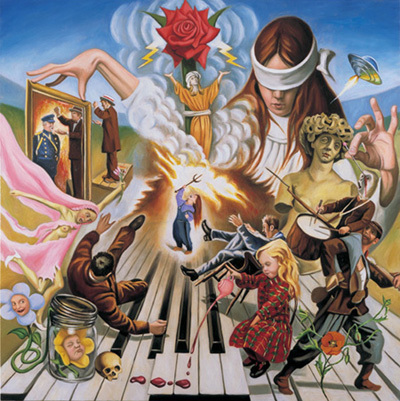 This image depicts Edward in a drawing by Pieter Schoolwerth, who painted the ART for the CD-single of this lyric book. This drawing, a gift to the tiny shining princess, was a study for his painting “Thee 83 Altered States ov Americka: Chapters 3 & 4,” which appeared in the ICA Boston GOTHIC exhibit. Lyrics for this book were compiled mostly from liner notes and from faxes and emails from Edward — with undeniable assistance derived from the transcription efforts of numerous fellow Pink Dot friends, as archived by Alan Ezust and Lars Tängmark. With appreciation and gratitude, especially to Jon Whitney and www.brainwashed.com. Post-publication thanks to Dot fans who have facilitated the appearance of lyric books at Dot shows: David Hicks, Erik Lanzillotta, Chris McBeth, Vik Pahwa, and Amanda Palmer. Special thanks to Lisette Sutherland, whose contribution is too immense to catalogue. And thank you to Jared Butler, who compiled the first printed collection of Ka-Spel lyrics, and who later invited me to share in a CONVERSATION about the making of this book. This page last updated 31 October 2013.